A tip to any public libraries struggling with declining patronage: go digging around in your vault! The public library in Windsor, Ontario discovered a Bible from 1585 languishing away in its vault earlier this year. Librarians promptly put the book on display and saw a 40 percent increase in visitors last month. 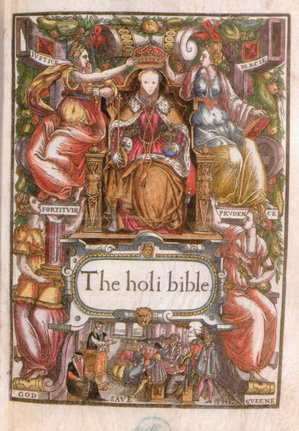 The Bible in question is a Bishop's Bible printed in London in 1585 by Christopher Barker. (The first Bishop's Bible was first printed in 1557 with subsequent editions following periodically until 1602. The final complete edition of the Bishop's Bible from that year was used as the basis for the King James Version of the Bible completed in 1611). The find makes the Windsor Public Library's Bishop's Bible one of the oldest books held by a municipal library in Canada. Brian Owens, Curator at the University of Windsor was also quoted in the Windsor Start article, "People are attracted to that which happened before our time," Owens said. "And there is a great difference between seeing a work online and actually seeing it in its true form." You can watch a little video showing pages from the 1568 edition of the Bishop's Bible and read more about it here. The Windsor Star quoted a local patron in its article about the find. "It's truly an amazing piece of art," said library user John Hilt. "I look at it every time I'm in here. I can't explain the feeling I get from just looking at it. The religious value is unmatched. But the historical value alone is unreal."